A new world record for the direct conversion of sunlight into electricity has been established. The multi-junction solar cell converts 46% of the solar light into electrical energy and was developed by Soitec and CEA-Leti, France, together with the Fraunhofer Institute for Solar Energy Systems ISE, Germany. It is the cooperation’s second world record within one year, after the one previously announced in September 2013, and clearly demonstrates the strong competitiveness of the European photovoltaic research and industry. The world record cell is a four-junction cell, and each of its sub-cells converts precisely one quarter of the incoming photons in the wavelength range between 300 and 1750 nm into electricity. When applied in concentrator PV, a very small cell is used with a Fresnel lens, which concentrates the sunlight onto the cell. 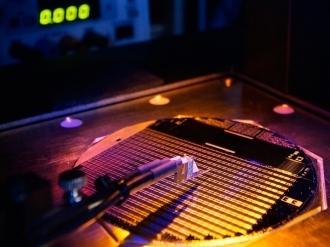 The new record efficiency was measured at a concentration of 508 suns and has been confirmed by the Japanese AIST (National Institute of Advanced Industrial Science and Technology), one of the leading centers for independent verification of solar cell performance results under standard testing conditions.